I’ve been writing about the River Ehen in Cumbria since I started this blog, sharing my delight in the diversity of the microscopic world in this small river along with my frustrations in trying to understand what it is that gives this river its character. 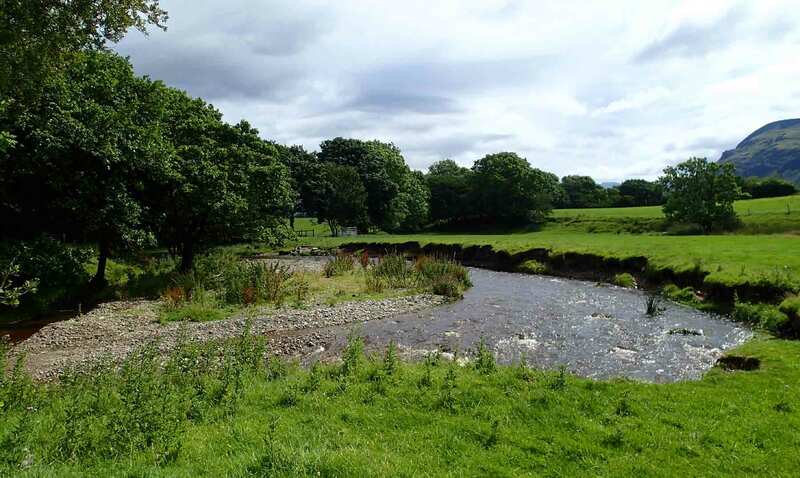 We know that the presence of a weir at the outfall of Ennerdale Water has a big influence so, in 2015, we started to look at a nearby stream, Croasdale Beck (photographed above), which is similar in many respects but lacks the regulating influence of a lake and weir. Maybe, we reasoned, the differences we observed would give us a better understanding of how the regulation of flow in the River Ehen influenced the ecology. Broadly speaking, any kind of impoundment – whether a natural lake or an artificial reservoir – removes a lot of the energy from a stream that might otherwise roll stones, move sediment downstream and, in the process, dislodge the organisms that live there. We noticed quite early in our studies, for example, that Croasdale Beck generally had less algae growing on the stones than in the nearby River Ehen, and also that the algal flora here was less diverse. There were also some quite big differences in the algae between the two streams. I wrote about one of the Cyanobacteria that are found in Croasdale Beck in “A bigger splash …” but there are also differences in the types of diatoms found in the two streams. Most diatomists think about ecology primarily in terms of the chemical environment within which the diatoms live but I think that some of the differences that I see between the diatoms in the River Ehen and Croasdale Beck are a result of the different hydrological regimes in the two streams. Several diatom species are common to both streams but two, in particular, stand out as being common in Croasdale Beck but rare in the River Ehen. These are Achnanthes oblongella (illustrated in “Why do you look for the living amongst the dead?”) and Odontidium mesodon. However, a closer look at the data showed that, whilst both were common in Croasdale Beck, they were rarely both common in the same sample. If Achnanthes oblongella was abundant, then Odontidium mesodon was rare and vice versa, as the left hand graph below shows. There were also a few situations when neither was abundant. Odontidium mesodon from Croasdale Beck, Cumbria, July 2015. Photographs by Lydia King. The story got more interesting when I plotted the relative proportions of these two taxa against the amount of chlorophyll that we measured on the stones at the time of sample collection (see right hand graph below). This gives us an idea of the total biomass of algae present at the site (which, in this particular case, are dominated by diatoms). Achnanthes oblongella was most abundant when the biomass was very low, whilst Odontidium mesodon peaked at a slightly higher biomass, but proportions of both dropped off when the biomass was high. I should point out that “high” in the context of Croasdale Beck is relatively low by the standards of other streams that we have examined and this adds another layer of complexity to the story. When the biomass exceeds two micrograms per square centimetre, both Odontidium mesodon and Achnanthes oblongella are uncommon in the biomass, and the most abundant diatoms are Achnanthidum minutissimum, Fragilaria gracilis or, on one occasion, Cocconeis placentula. A. minutissimum and F. gracilis are both common in the nearby River Ehen but C. placentula is very rarely found there. The difference between River Ehen and Croasdale Beck is probably largely a result of the very difernt hydrological regimes, though this is an aspect of the ecology of diatoms that has been studied relatively rarely. The differences within my Croasdale Beck samples is probably also a result of the hydrology, but reflects changes over time. I suspect that Achnanthes oblongella is the natural “pioneer” species of soft-water, hydrologically-dynamic streams, and that Diatoma mesodon is able to over-grow A. oblongella when the biomass on stones increases due to prolonged periods of relative stability in the stream bed. That still does not explain what happens when biomass is high and neither are abundant: the dataset is still small and we need to collect some more data to try to understand this. But the point of the post is mostly to remind everyone of the dangers of trying to interpret the ecology of attached stream algae solely in terms of their chemical environment. And to make the point that a little more understanding of a natural system often fuels, rather than removes, the sense of mystery that is always present in nature. a. The relationship between representation of Achnanthes oblongella and Odontidium mesodon in samples from Croasdale Beck between May 2015 and January 2017. 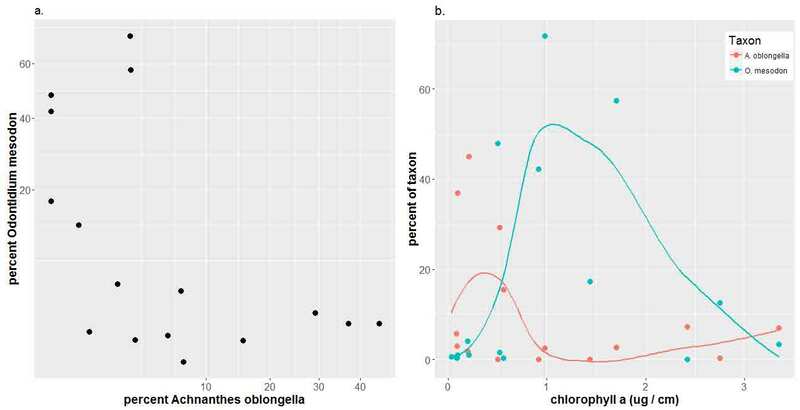 Both axes are presented on square-root-transformed scales; b. relationship between representation of Achnanthes oblongella and Odontium mesodon and total epilithic biomass (as chlorophyll a). Lines show a locally-weighted polynomial (LOESS) regression fitted to the data. Odontidium mesodon is the correct name for Diatoma mesodon (see “Diatoms from the Valley of Flowers”). The name Odontidium had fallen out of popular usage, but Ingrid Jüttner and colleagues made the case to resurrect this genus for a few species that would hitherto have been classified in Diatoma. Achnanthes oblongella, by contrast, is definitely not the correct name for this organism. Three other names have been proposed: Karayevia oblongella, Psammothidium oblongella and Platessa oblongella. The first two are not convincing and I have not yet been able to see the paper describing the third. It will be interesting to see what a combined morphological and genetic study of this species (or, more likely, complex) reveals. Jüttner, I., Williams, D.M., Levkov, Z., Falasco, E., Battegazzore, M., Cantonati, M., Van de Vijver, B., Angele, C. & Ector, L. (2015). Reinvestigation of the type material for Odontidium hyemale (Roth) Kützing and related species, with description of four new species in the genus Odontidium (Fragilariaceae, Bacillariophyta). Phytotaxa 234: 1-36. Wetzel, C.E., Lange-Bertalot, H. & Ector, L. (2017): Type analysis of Achnanthes oblongella Østrup and resurrection of Achnanthes saxonica Krasske (Bacillariophyta). Nova Hedwigia Beiheft (in press). This entry was posted in Uncategorized and tagged Croasdale Beck, Cumbria, diatoms, ecology, hydrology. Bookmark the permalink.